Share Your Video for a Chance to Attend LAC 2019! Help show your support for the school meal programs! Create a short video that shows how school meals make a positive impact in your school or community! A panel of judges will select finalists among those videos submitted and create an online poll to vote for the best video. The SNA member who submits the video with the most votes will win a free trip to SNA’s annual Legislative Action Conference (LAC) 2019. LAC 2019 will be held in Washington, D.C. February 23-26! The winner will enjoy one free LAC registration for two, flights and hotel accommodations, as well as be recognized during the Opening General Session. SNA will also reserve VIP seats for the winner at LAC 2019 for themselves and a guest. To enter, you must be an SNA member and complete the LAC 2019 Sweepstakes Online Form by November 14, 2018. You may also email videos to advocacy@schoolnutrition.org. 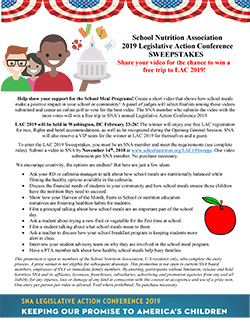 For video ideas or to learn more, view the LAC 2019 Sweepstakes Flyer or read the complete sweepstakes rules. One video submission per SNA member. No purchase necessary.